Wrangler (Laoban-Promising Vow, by Broken Vow), brings a sale-topping $140,000 at the Fasig-Tipton Saratoga Fall Mixed Sale. Weanlings from the first crops of their sires are always a point of interest at mixed sales, and with Wrangler being a member of the debut class from Sequel New York resident Laoban, the young colt rode that intrigue all the way to the top of the Fasig-Tipton Saratoga Fall Mixed Sale. Going through the ring on Oct. 15 as Hip 180, out of the Broken Vow mare Promising Vow, Wrangler drew the highest price of the auction when Bluewater Sales, agent, hit the closing bid for $140,000. What the colt's future holds – whether he will be kept to race or pinhooked at a later sale – remains to be seen, but what he had already accomplished in the auction ring was a coup for building the fledgling commercial resume of Laoban, a Grade 2-winning son of Uncle Mo. 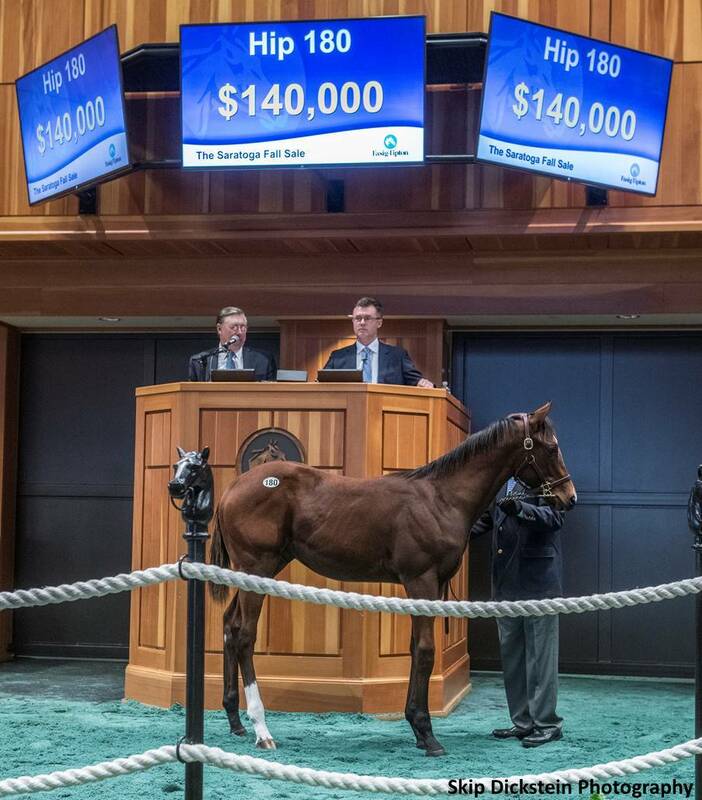 In the latest edition of the series, we take a look at Wrangler's time at the Fasig-Tipton Saratoga Fall Mixed Sale from the perspective of Becky Thomas, Molly Lightner, and Teri Brown of Sequel New York, and Meg Levy of Bluewater Sales who selected him. Lightner: This is my favorite sale. It is much more laid back than the Saratoga yearling sales. The trees are beautiful. And being the first mixed sale of the year, it is fun to get a first look at the babies. Brown: People overall seemed impressed with Wrangler and how much he looked like Laoban, conformation-wise. For a weanling, he handled the process very well. It's a lot to handle since it is their first time ever away from the farm. There were only a few times when he got a bit tired of all the bustle and handling, but overall, he did well. Lightner: Weanlings are shown the same way as any other horse, but maybe with a little extra patience. Sometimes they really don't want to go back in the stall. When that happens, we try to do that quietly after the people that were looking at them are gone. Wrangler had 68 shows in total. We thought he would do well as he was very well received, but that price exceeded all expectations. Wrangler (Laoban-Promising Vow, by Broken Vow), on sale day at the Fasig-Tipton Saratoga Fall Mixed Sale, where he brought $140,000. Brown: For the most part, the daily sale-grounds routine stays the same on sale day. You try to keep a routine as much as possible for the horses. Preparation for the ring is just a little more attention to detail than that for the showings. Lightner: Wrangler handled sale day like a pro. By the time we get to the back ring, the decisions are already made for the most part in terms of which horses people like. They still need to show themselves well, and the buyers need to be in place. Brown: I was back at the sale barn to help with preparations with the other horses when Wrangler went through, but checking the monitor to see how he was doing. You're always anxious for them to do well, but I felt confident he would, as he was very popular and is an exceptional colt. I loved Wrangler's temperament and personality, he was especially nice for a colt and very smart. It made him fun and easy to work with. Lightner: I was outside in the back by the bid spotters trying to figure out who was bidding so that I could thank the new owner. I was very excited for him to top the sale and was very happy to see Meg Levy of Bluewater Sales signing the ticket. Thomas: I was in my usual place in the back and was very excited to be offering such a nice colt. This is a very exciting start for a young sire, in Laoban. It helps having such a strong support group. We sent nice mares to him. So did McMahon of Saratoga Thoroughbreds. Laoban received phenomenal support from Southern Equine who sent him very nice mares. And by breeding more mares than any other stallion in New York for the past two years, the numbers will help ensure a very bright future. He is stamping his foals and proving to be a cookie cutter of the Uncle Mo style of stretch and athleticism. I love how Laoban is stamping his foals and I love that Wrangler got the job done at Saratoga. Wrangler is not unlike many of the Laobans I have seen, which is very exciting. I will have several that will be sold as yearlings and certainly at the 2-year-old sales. Foals of New York's Uncle Mo could not be off to a better start. Lightner: We are wishing everyone the best of luck with Wrangler, as well as all of the Laoban foals. And, we are very excited to meet Wrangler's little brother by Union Jackson sometime in April. Levy: The Laoban colt was just an absolutely stunning physical. He really caught my eye. There were so many good-looking Laobans up there, it was tough, but like any other good son of Uncle Mo, they seem to be so consistent. Knowing Laoban myself from when Southern Equine raced him, he's a very good-sized horse. I just recognized the Uncle Mo blood in there, and that's been such a success. This one, in particular, I thought was the very best one, He had a lot of flash to him. I think he's going to be a great racehorse. We're very happy. The buyer is thinking to race the colt at this stage, but of course, he's a baby. There's a lot of in-between time. I don't own him myself, so you never know what the owner is going to decide to do. It all depends, but I love stallions that throw such consistent physicals in their first crop, and they all had great walks, really elegant, great hips, long-legged. They look like sound, good-moving horses. I was actually a little surprised that he brought that kind of money. I thought maybe $100,000, but you never know. That New York sale, the horses sell well there. Follow each part of Wrangler's path to the sale below. 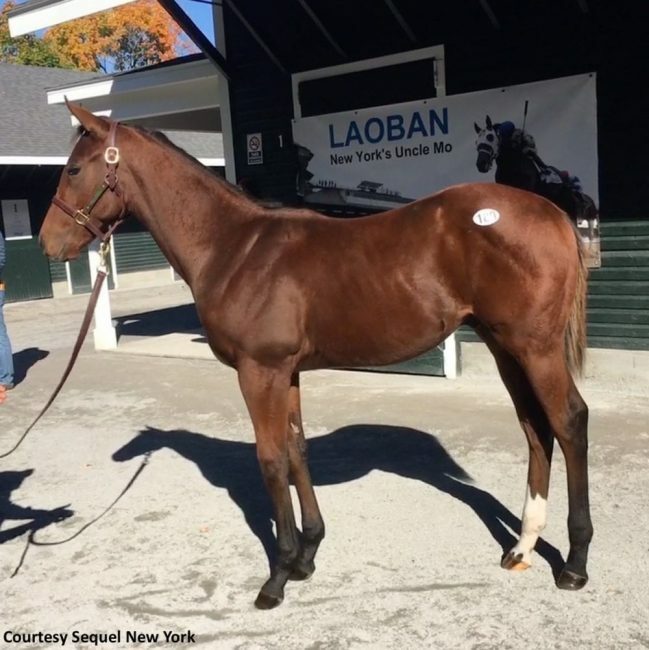 This entry was posted in Bloodstock, Follow A Foal, NL List and tagged Becky Thomas, Bluewater Sales, fasig-tipton saratoga fall mixed sale, Follow a Foal, laoban, Meg Levy, Molly Lightner, Promising Vow, sequel new york, teri brown, Wrangler by Joe Nevills. Bookmark the permalink.